The solar-panel industry in China is facing operational difficulties because of anti-dumping tariffs of as much as 50 percent imposed by the United States. Japanese newspaper Nikkei Shimbun reported on July 26 that the solar-panel industry centered in Changzhou City, Jiangsu Province—also known as the “Eastern Silicon Valley”—has been severely affected since the United States imposed the tariffs in January, especially in combination with Beijing reducing government subsidies, and falling electricity prices. Domestic factories’ operating rates have dropped sharply, while some factories have closed, employees have been laid off, and salaries have been reduced, according to the Nikkei Shimbun. Former employees of solar-panel factories told the newspaper that workers’ wages dropped in June to about 2,000 yuan (about $290)—about half of last year’s typical monthly salary. In early July, 800 former employees of GCL-Poly, a solar-product manufacturer based in Changzhou, staged a protest. Some employees were let go beginning in June, while others left the firm after the company requested they take pay cuts, according to local media reports. China surpassed Germany in 2015 as the country with the most installed solar capacity. In 2017, China’s photovoltaic market topped the 100-gigawatt milestone—enough energy to power 70 million homes. And in 2017 alone, the country’s solar output increased by 40 percent, reaching 75 billion watts. That amount is three times as much as five years ago. China’s solar-panel products occupy 70 percent of the global market, a result of years of dumping government-subsidized panels in other countries’ markets. In June, Chinese-imported solar cells and modules were the target of the United States’ 25 percent tariffs, part of the $50 billion worth of Chinese products to be targeted, amid the trade war between China and the United States. In addition to such tariffs, China’s National Energy Administration at the end of May announced reforms to pricing structures, including lowering the price of renewable energy by an average of 10 percent. Then, Beijing cut subsidies for solar-panel manufacturers in June. 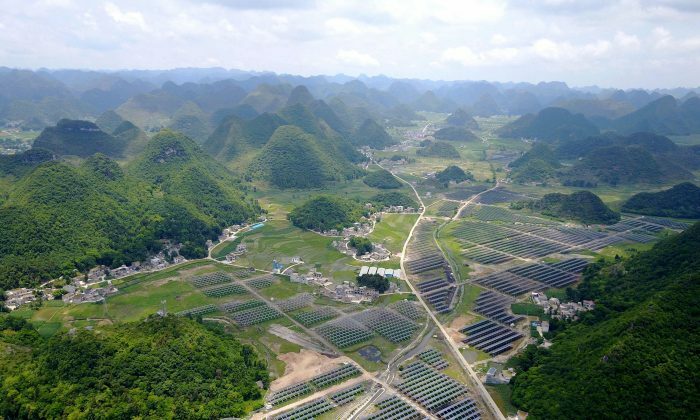 China is attempting to cool an oversaturated solar industry that is already supplying more than the demand, and likely announced those changes to curb unsustainable growth. State funds for subsidizing domestic renewable energy companies were also running low, resulting in a deficit of 12.7 billion yuan (about $16.6 billion) as of the end of 2017, according to data from the National Energy Administration. In addition, several Chinese media have cited recent comments by Wang Sicheng, a researcher at the National Development and Reform Commission, a state agency in charge of monitoring and planning the Chinese economy. He said China’s solar industry is expected to lose 1 trillion yuan ($146.8 billion) and 2.5 million jobs as a result of the latest decline.